There is a new Central NHS Computer System called the Enhanced Summary Care Record (SCR). It is an electronic record which contains information about the medicines you take, allergies you suffer from and any bad reactions to medicines you have had. 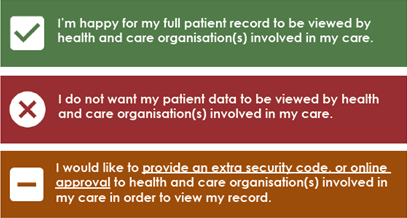 Why do I need an Enhanced Summary Care Record? Most of our patients already have a summary care record, where medications and allergies can be viewed, if you choose to add additional information to this such as relevant problems, communication needs etc. this will further increase the quality of your care - Quicker access, diagnosis and treatment. For more information please speak to a member of the reception team. You can also get more information about Sharing your medical record by reading our Quick Start Patient guide to sharing. No, it is not compulsory. If you choose to opt out of the scheme, then you will need to complete a form and bring it along to the surgery (see below). If the answer is YES - please contact our reception team who can update your medical record.